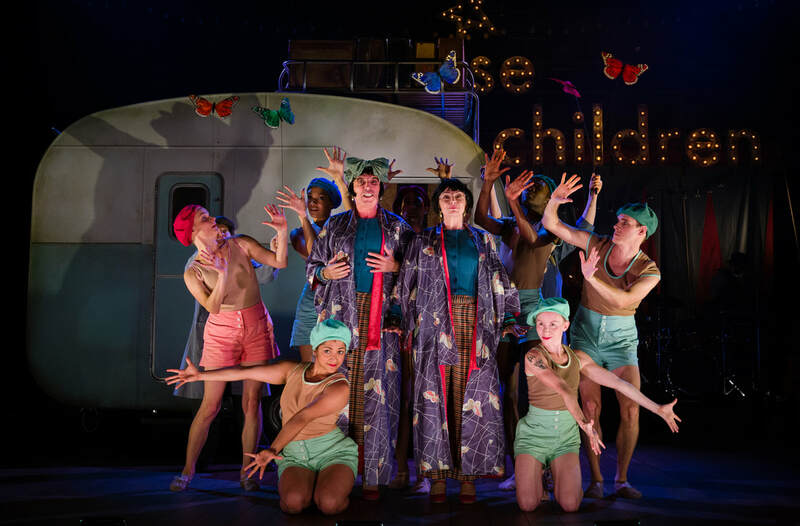 The strange tale of identical twins Nora and Dora is played out in Emma Rice's Wise Children. The tale of Emma Rice’s unhappy spell at the helm of The Globe in London has been well documented. Since her departure from that traditionalist Shakespearean playhouse, she has returned to what could probably be argued to be her roots, with touring, fantastical theatre aimed at reaching the parts other theatre doesn’t reach. There’s more than a whiff of her former company Kneehigh about her new project, Wise Children, which takes its name from the Angela Carter novel she has adapted for its first show. Co-produced by the Belgrade, the Old Vic, Oxford Playhouse and York Theatre Royal, it’s a glossy, glamorous affair of stylized faded grandeur, feting a lost world of vaudeville and 20th century England. Rice herself performs in the last leg of the show’s UK tour, but it’s very much an ensemble piece, with a cast of 12 and a band of three attempting to cram the sprawling, unwieldy narrative into two-and-a-half hours of stage time. It’s a tall order, and much of the story is necessarily whizzed through as the lives of identical twins Nora and Dora Chance are played out from before their birth to their 75th birthday. There are some nice theatrical flourishes. Three sets of performers play the girls at different stages in their lives, with the oldest pair narrating the tale as a kind of Greek chorus. Old Kneehigh tricks with props, puppets, costumes and sleight-of-hand are used very effectively as part of the storytelling magic, and there’s a warmth to the endeavour, along with the yellow lighting, that adds much to its appeal. Personally, I’m not greatly engaged by the story itself. There’s something seedy about the misogyny, selfishness and even child molestation at its heart, especially when contrasted with the merry vaudevillian slapstick way in which much of it is presented, that leaves an extremely uncomfortable taste. Far too many of the characters are just plain unpleasant, making an evening in their company rather testing at times. There’s also something relentless about the insistent musical underscore – although the occasional jazz standard along the way provides a welcome interlude. But it’s all done very proficiently, with high production values and a twinkle in its eye. And the ovation from much of the audience suggests there’s plenty of room for this kind of end-of-the-pier, easily digestible fantasy. Somebody somewhere had a stroke of genius. Combining musical theatre and a cruise makes for a genuinely engaging personal experience wrapped up in the glitz and glamour of spectacle and showmanship. Chaos: Elizabeth McGovern, Amanda Abbington and Ralf Little in God of Carnage. Hailed as a riotous satire on the pretensions of the middle classes, Yasmina Reza’s God of Carnage holds a fascinating place in modern French theatre, second only to her earlier play Art. Its English adaptation by Christopher Hampton has never quite worked for me, usually performed in a slightly awkward, stilted manner that creates obstacles to its barbs really hitting home. No such problems beset Lindsay Posner’s new version at Bath, which fizzes and frazzles through a blistering 75 minutes or so with barely a pause for breath and every thorn sticking pointedly. It’s still a not-very-nice play about four rather unpleasant people, but in the hands of Posner and his wonderful cast, it carries a fresh menace in its Gallic humour. In their classy, tasteful home, Veronica and Michael are playing host to Annette and Alan to discuss the unruly playground behaviour which has led to their son being injured by the boy of the other couple. A meeting that begins with civility and apparently common purpose descends, in real time, into warring chaos just as savage and lawless as that of their offspring. So far, so farcical. But the quartet of actors take their raw material and craft something so delightfully painful that it is simply mesmerising to watch. Elizabeth McGovern’s pretence at a higher moral code is wonderfully shattered as her beloved possessions and nurtured pomposity are ripped apart. Nigel Lindsay’s working-class boy made good makes the perfect foil for her, sometimes feeding her idiosyncrasies, sometimes exposing them cruelly. As the visiting parents, Amanda Abbington and Ralf Little are a joy to behold. Abbington is feisty and forthright on the front foot but vulnerable and defenceless in retreat, while Little imbues his lawyer character with just the right amount of disdain and disinterest – until he’s brought crashing into the real world in a moment of theatrical brilliance. On a beautiful set by Peter McKintosh, elegantly lit by Howard Harrison, Posner manoeuvres his players like a chess grandmaster, never allowing the action to fall too still and using the space and angles to carefully-judged effect throughout. The laughs are never cheaply bought but always well deserved, and the interaction between and within the two couples is impeccably drawn. It’s as fine a representation of this tricky play as I’ve seen and should, if there’s any justice, get a life beyond its run in Bath. One of the UK’s leading open-air touring companies, Heartbreak Productions, has had something of an extra feather in its cap in recent years: the rights to stage adaptations of the children’s books of David Walliams. This year, following in the footsteps of the likes of Ratburger and Mr Stink, they are taking The Midnight Gang out on the road for a huge nationwide expedition. This performance, unusually staged indoors, is the first time the company has taken on the vast, echoing vaults of Coventry Cathedral. In truth, the venue does the six-strong ensemble few favours, swallowing up their lines and leaving the observers straining to hear some of the nuances of Derry Pope’s clever songs. Leaving aside the constraints of the venue, however, there is a wealth of entertaining material to enjoy in David Kerby-Kendall’s spirited adaptation. Director Kristoffer Huball wisely keeps the action moving swiftly from scene to scene, never allowing the attention of the captivated young audience to wander. And among the cast, there’s a whole host of likeable, laughable characters on display in the hospital children’s ward where the titular Midnight Gang get up to out-of-hours shenanigans, from the too-sick-to-join-in Sally (Meg Chaplin) to the eager, slightly dim-witted protagonist Tom (Adam Simmons). Benjamin Darlington, Grace Hussey-Bird and Matthew Cooper complete the gang very capably, while Howard Scott Walker provides plenty of fun with both his hunchback porter and his panto-dame matron. It may be aimed predominantly at the youngsters, but there’s good fun to be had for the grown-ups too, whether it’s a sly poke at the Health Secretary or a charming polar bear ripping up the stage in one daft sequence. Importantly, it never takes itself too seriously, even when the message becomes potent. And ultimately, that’s where Heartbreak consistently scores highest. Like the regular steam train that the three Waterbury children look out for every day in Edith Nesbit’s children’s classic, The Railway Children has become a firm favourite with Heartbreak audiences. So much so that this production – first toured in 2006 – remains very much at the heart of the company’s repertoire. That’s not to say that it feels in any way stale or by-numbers. In fact, quite the reverse is true. Thanks to the constant focus and energy of the cast and a deft though uncredited adaptation, the production feels fresh, vibrant and endlessly entertaining. A cast of five perform on a cleverly designed traverse stage from designer Kate Wragg, which converts in the blink of an eye from station platform to steam engine footplate and the pace of Miriam Higgins’s direction never flags. Ashleigh Aston narrates as the oldest Waterbury child Roberta – or Bobby – who shepherds her siblings Phyllis and Peter (delightful, believable performances from Faye Lord and George Naylor) alongside her anxious mother (Bryony Tebbutt) while their father is away undergoing some indeterminate trial for unspecified but trumped-up charges of treason. The fifth member of this capable ensemble is Shaun Miller, and full credit must be given for his extraordinary versatility, in both characters and accents. From a broad Scottish stationmaster Perks to a Russian emigre, via a grammar-school boy and a couple of feisty female roles, Miller repeatedly threatens to steal the show, saved from doing so only by virtue of the talents of the rest of the cast. The Railway Children is one of four shows being toured by Heartbreak Productions this season – the others are Much Ado About Noghting, Pride and Prejudice and a new adaptation of David Walliams’s The Midnight Gang – and in the open-air setting of a British summertime, regardless of the weather, it genuinely warms the cockles like a steam locomotive’s firebox. What do you get if you combine one of English literature’s favourite comedies of manners, a glorious evening by a pretty lake and a healthy dose of tongue-in-cheek theatre? It’s that time of year when open-air performances declare that the British summer has well and truly arrived. Like the first swallows, the launch of a Heartbreak Productions tour is as good a signal as any that we’re into the season of lazy evenings in picturesque surroundings, possibly with a glass of something fizzy and the prospect of a charming couple of hours in the hands of some talented actors and a spot of engaging storytelling. As long as the weather holds. Pride and Prejudice, revived by Heartbreak after its last outing in 2014, does not disappoint. It features a sparkling script by resident writer David Kerby-Kendall, remaining true to the spirit of Jane Austen’s original much-loved novel while introducing a few twinkly-eyed moments all of its own, and a hard-working cast of five who bring to life the entire population of Austen’s book with a wonderful array of characterisations and hats. Abigail Castleton provides the linchpin as Elizabeth Bennet, narrator and protagonist of the tale of five sisters in want of husbands, but it’s entirely an ensemble affair, with Samantha Dart and Lauren Moakes creating Elizabeth’s sisters, mother, friends and foes with endless variety. George Attwell relishes his own clutch of cameos – particularly enjoyable is his creepily ingratiating clergyman Mr Collins – while Ben Thorne is dark and dashing as Mr Darcy and witty and withering as Mr Bennet. Director Rebecca Gadsby keeps the action moving briskly, and the story is never less than crystal clear and elegantly drawn. The evening sunshine in Jepson Gardens might help, but the entertainment alone is more than enough to warm the heart. What did you expect? Nichola McAuliffe as Miss Havisham and Sean Aydon as Pip in Great Expectations. It’s an ambitious project to take one of the weightiest, wordiest works of literature and translate it into a pacy, punchy piece of theatre. So full marks to the team at Tilted Wig, co-producers with Malvern Theatres, for living up to the Great Expectations which Dickens’s popular novel placed upon them. The densely-populated, fast-moving narrative of the episodic original has been deftly distilled by writer Ken Bentley into a little under three hours of gripping storytelling. Much more than simply putting Dickens’s words onto the stage, the script manages to create genuinely dramatic moments and scenes, even when vast chunks of exposition are being downloaded. In this endeavour, the play is aided enormously by a nine-strong cast of highly talented performers. They’re led by Nichola McAuliffe as the impenetrable Miss Havisham, a kind of prototype Kate Bush character whose whims and weirdness are beautifully drawn and who provides a central axis around which the sprawling action revolves. Sean Aydon’s Pip ages extraordinarily from small rustic child to educated city gent as a host of bizarre but three-dimensional creations enter and exit from his life, all woven into a kind of thriller narrative uncovering who did what to whom and why. Standout characterisations include Edward Ferrow’s deeply moving Joe Gargery, Daniel Goode’s terrifying criminal Magwitch and James Dinsmore’s scheming lawyer Jaggers, but the whole company bring energy and variation to their multiple roles, peopling the production with memorable cameos and powerful moments. It’s all accompanied by multi-instrumentalist Ollie King, who’s nifty with a mournful melodeon and feisty with a fiddle, and it plays out on an inventive, clever set (James Turner) consisting of a kind of iron-framed cube from which props, scenery and effects emerge and interact as required. Sophie Boyce Couzens keeps a clear directorial hand on proceedings, with the aim evidently of keeping things rolling relentlessly on, and the pace never drags for a second. This doesn’t prevent her from finding moments of stillness and emotion, while some of the big set-pieces – a fire or a dramatic encounter on the Thames – are achieved with brilliant simplicity and effectiveness. It’s a classy version of the classic tale and a fine tribute to this small but perfectly formed company, only in its second year of operation. But don’t hang about to catch it: it’s only in town until Saturday. There’s something utterly charming about the notion of Jane Austen hosting a writing group that might have included William Wordsworth, Samuel Taylor Coleridge and Mary Shelley. The charm provides an underscore of delightful daftness to Dani Carbery’s twinkling adaptation of Austen’s first completed novel. And it’s also a trademark of the company delivering the evening, the Leamington-based touring group Heartbreak Productions. The company’s versatile teams of actors are more usually to be found in country house gardens, public parks and other open-air spaces for their summer tours, now in their 26th year. Here, the Northanger Abbey sextet are kicking off a week of indoor performances that will wrap up this year’s schedule. At the risk of sounding like one of Austen’s more churlish characters, the show seems to lose some its innate sparkle by being confined to the indoor setting. While offering welcome respite from a downpour beyond the four walls, the limitations of a building put a restrictive formality around the proceedings which the open-air format manages to avoid. Having said that, the performers do their utmost to whip up an audience-involving atmosphere of jolliness and frivolity, peaking in a wonderfully silly storm sequence in which sections of the crowd provide increasingly bizarre sound effects. Somewhere in there, Austen’s tale of Catherine Morland and her introduction to Bath society and the travails of love is played out with verve and conviction, employing all manner of improvised props from chalkboards to chests. A world of characters is brought amiably to life, with no opportunity missed for a laugh from a cross-dressing matron or a coconut-bashing ‘horse’. Dominic Waldron’s direction keeps the pace lively, and the cast are relentless in their enthusiasm and energy, whether they’re playing a Bath beau or a bunch of daffodils. To maintain these levels of freshness and commitment this late in the nationwide tour is not only a reflection on them but also a tribute to the spirited Heartbreak ethos. What better place for a production of The Secret Garden than… a secret garden? Touring company Heartbreak Productions did not have to venture far from their Leamington Spa base to find the intriguing pocket park Foundry Wood, where an open-air classroom serves as an intimate arena for their latest summer outing. Adapted from the much-loved children’s novel by Frances Hodgson Burnett, The Secret Garden is an Edwardian perennial which blossoms into a tale of friendship, loyalty and optimism. As its adapter David Kerby-Kendall admits, distilling the host of characters into a manageable story delivered by a hard-working cast of just five presents something of a challenge, but it’s one that the ebullient team overcome with plenty of goodwill and bags of likeability. The five – Abigail Castleton, Lucy Formby, George Attwell, Ross Ford and Gareth Cary – are relentlessly enthusiastic and good-natured and the audience, ranging in age from toddlers to pensioners, are won over from the pre-performance games through to the final bows. Using the framing device of the 10th annual Misselthwaite horticultural show, the team tell Burnett’s classic story of 12-year-old Mary Lennox, sent back to England from India after her parents’ death to live with an uncle she’s never met. There, she faces the challenges of a new country, new people and even a new language – the Yorkshire dialect. The way she meets these challenges unfolds with an upbeat charm that is never less than winning. Staged against a clever but simple backdrop designed by Kate Wragg and enhanced by the innocence of some a cappella singing and solo flute, Paul Chesterton’s production maintains a well-judged pace and tells its story clearly and entertainingly. Formby develops Mary believably from spoilt brat to open-hearted heroine, while her colleagues relish every opportunity for comedy and fun. There can be few greater compliments than the rapt attention of an entire audience, from wide-eyed child to delighted grandparent. What could be more quintessentially English than a brisk, rousing production of Shakespeare on the terrace of a glorious stately home? Yes, it’s that time of year again when the popping of corks and the clink of champagne flutes heralds the energetic, relentlessly likeable performances of Heartbreak Productions, a Leamington-based professional touring company dedicated to taking a range of shows out across the country come rain or shine. It helps a bit when the venue is a country house of significant style and beautiful location, and the weather is dry and conducive to an evening’s elegant entertainment, rather than blowing some kind of summer storm. But the enthusiasm and commitment of the Heartbreak casts means that a smile is never far away and the audiences invariably go home happy. In an accomplished act of bravado, this production – one of five that are out on the road this season – performs the Bard’s complicated, difficult battle of the sexes with a cast of just five. Some smart doubling accounts for most of the roles, but there’s a delightful twist involving audience participation and a running name gag when it proves a step too far having two particular characters in the same scene. The knowing wink and sense of collusion that is mined from making a feature out of a problem only adds to the fun. Ross Ford’s Petruchio is a blustering bully of a leading man, willfully and deliberately destroying his Katherine, only to crumble into regret in the final moments. Abigail Castleton plays his victim with a delicate balance of fiery resistance and stoic compliance, and her late speech on how women should submit to their husbands is rendered with more than a hint of irony and accusation. Lucy Formby and Gareth Cary gamely supply a multitude of supporting roles, with George Atwell getting perhaps the greatest opportunity for extracting comedy from his scenes as, variously, servant, suitor and senior citizen. And director Paul Chesterton certainly finds the humour in the text, pacing things rapidly so that the momentum never flags. There’s also a neat framing device that allows a smooth transition both into and out of the Shakespeare play, while maintaining the illusion of the country house soiree perfectly. With The Secret Garden, Murder on the Terrace, Northanger Abbey and David Walliams’s Billionaire Boy also on the menu around the UK, Heartbreak have served up another veritable summer picnic. David Hare’s forensic examination of the state of the Church of England around the turn of the 1990s may seem a little dated nearly 30 years on. But start to dig deeper into his sensitive, subtle subtext and you realise that Racing Demon is far more than a snapshot of one dusty corner of English life: it is a true state-of-the-nation play. Written as one of a trilogy – the others looked at politics and the law – the piece is not simply a moment of time caught in Hare’s lens. It’s about how a certain kind of middle English society lives with itself in a changing world and manages to sweep difficult decisions away from public view and even private consideration. Closing one’s eyes and running away seems the favoured approach. And how resonant is that today? Director Jonathan Church has taken over responsibility for the annual Bath summer season and kicks it off here with a strong opener. The production may feel a little static at times, and Simon Higlett’s designs not quite smoothly enough delivered for easy scene transitions, but there’s plenty in the way of atmosphere, drama and brilliance on view. The ensemble is headed by a wonderfully vacillating David Haig as Lionel, the city centre priest who refuses to thrust religion on his worldly parishioners for fear of frightening them away. This brings him into conflict with both his boss, the fiery traditionalist Bishop of Southwark, and his new curate, a wide-eyed neophyte with all the misguided passion of the fundamentalist. This crucial trio holds the narrative thread together superbly. Haig is relentlessly polite, making his defensive points with slightly wavering tones to emphasise the uncertainty of his position, and makes a terrific lightning rod through which the action strikes. Paapa Essiedu, fresh from an acclaimed Hamlet at the RSC, captures exactly the right kind of naïve certainty as his exuberant underling. And Anthony Calf is wonderfully authoritative as the bishop, constrained by his robes until finally driven to the point of explosion. There are some delicate, thoughtful performances among the supporting cast too, notably Lionel’s clerical colleagues, the cheerfully oblivious Donald (Sam Alexander) and the touching Harry (Ian Gelder), struggling with his forbidden homosexuality. Hare’s women are generally less successfully drawn, but where he’s at his most powerful is when he skewers the attitudes and psychological motivations of his central characters to enormous dramatic effect. Significantly, too, in Racing Demon he offers little in the way of answers, leaving the audience to make up its mind about exactly where it stands on some of these thorny issues. Far from being a period piece, that makes it a challenging work of contemporary theatre. Cabaret is alive and well and living in a cosy basement in Chelsea. Those who have told of its demise clearly haven’t seen the classy pairing of Joanna Strand and Jacqui Tate in performance with their beautifully compact and well-judged band. Each a West End soloist in their own right – Strand is currently in Phantom of the Opera, Tate most recently in the ‘lost’ Rodgers and Hammerstein musical Allegro – together their act is more than the sum of its parts and creates an infectious blend of fun and finesse. Strand is every inch the elegant chanteuse, effortlessly commanding material as varied as opera and the Great American Songbook, while Tate is a cheeky natural comedienne with a belter of a voice to match. Their rendition of the Flower Duet from Lakmé, delivered as two air hostesses on a British Airways flight, brings the house down. The set list is a smart mix of laughs and lushness and the pace is never allowed to flag. Coupling smooth jazz with light-hearted silliness showcases both performers to superb effect, and both are equally comfortable with every aspect of the fare on offer. Every note is pitch-perfect and there’s clearly as much enjoyment on stage as in the audience. The band are a vital component in this terrific package. Seldom is the accordion regarded as an essential part of a jazz combo, but ‪Romano Viazzani’s subtle and supportive playing adds real texture to the line-up, occasionally breaking out as an unusual lead instrument. Pianist John Bailey runs the music impeccably, his own playing a virtuoso combination of thoughtful accompaniment and jazz brilliance, while Yaron Stavi and Jason Reeve provide a solid yet imaginative backline on bass and drums respectively. Pizza Express’s downstairs venue, The Pheasantry in Kings Road, plays its part too. A slightly awkwardly-shaped room, with the stage plonked almost in the middle of the diners, it manages to overcome its architectural limitations to generate intimacy, warmth and an atmosphere of camaraderie that’s hard to resist. Strand and Tate unveil their cabaret act from time to time, when other commitments allow. Keep an eye out for them and circle the next date. Multi-talented: Gary Sefton directs and plays Scrooge in A Christmas Carol. Photo by Graeme Braidwood. No offence to the good folk of Corby, but nobody could honestly say that the unremarkable East Midlands town was high on their list of cultural attractions. There are tidings of comfort and joy, however: Gary Sefton appears to be on a mission to change that. Fresh from appearing alongside Glenda Jackson in King Lear, the multi-talented performer and director now presents his own adaptation of the Charles Dickens Christmas classic, playing the role of Scrooge himself and leading a company of seven through a blistering, boisterous hour of drama with just the right mix of thrills and fun. Sefton has form in this area. He directed another version of the story at Royal & Derngate in nearby Northampton four years ago, and the wise men there – who also oversee this smart, modern venue – clearly realised the gold that they had. The same warmth and wit that characterised that adaptation, albeit on a larger scale with bigger budgets, shine through in this confident new staging. Sefton, as deft and inventive on stage as his direction is off it, brings with him Andy Williams from that earlier cast, here playing (among many others) a mildly terrifying Jacob Marley and a merry master-of-ceremonies in the shape of Mr Fezziwig. Audience participation in the Fezziwig Christmas ball is one of the highlights of the show, although the anarchic snowball fight comes close. On the subject of mildly terrifying, it’s probably worth noting that some of the ingenious and impressive theatrical effects may need to be flagged up in advance for those of a nervous disposition. While the production is emphatically a wonderful introduction to Dickens’s tale for theatregoers of all ages, the Ghost of Christmas Future, for one, has the potential to astonish and perhaps alarm if you’re not prepared for it. 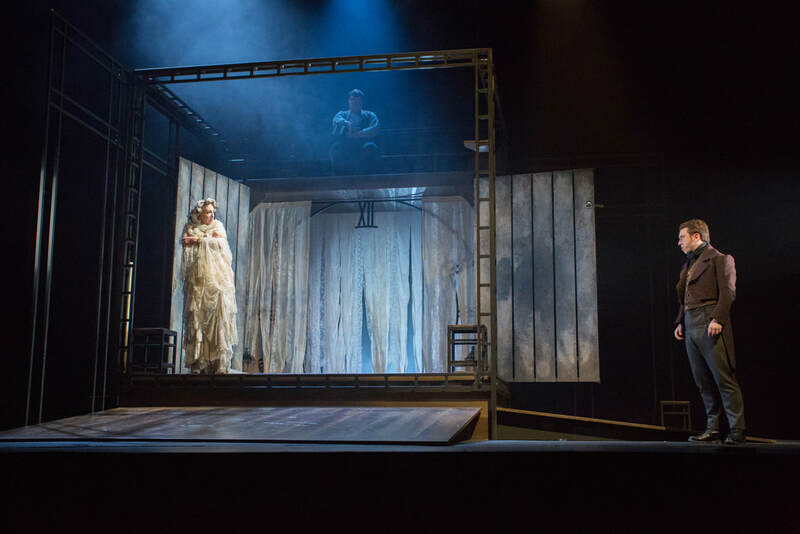 Michael Taylor’s simple design provides a huge brick-wall backdrop to a bare thrust stage, with all the atmospheric work done by props, costumes and copious amounts of cobwebbing. 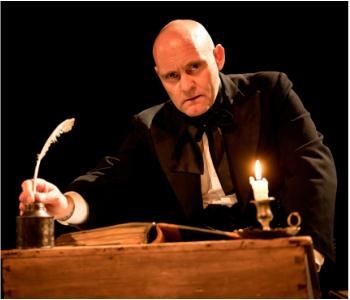 Richard Godin and Aaron Dootson’s lighting adds much in the way of spectacle, while Tom Kelly’s musical arrangements of some old festive favourites are utterly charming, refreshing them in exactly the same way that Sefton’s adaptation does for Dickens himself. The ensemble are uniformly excellent, with much doubling and some capable local youngsters helping to flesh out the sizeable list of characters. Stuart Angell and Miriam Grace Edwards are especially touching as the Cratchits and Tom Wainwright skillfully reveals the avaricious change that occurs in the young Scrooge. There’s no high-tech wizardry at work here, just quality old-fashioned stagecraft and some genuine talent telling a story that’s as meaningful and good-hearted as it ever was. And a merry Christmas to you all. There are a multitude of questions waiting to be answered about this clever, intriguing creation in the shell of Blackpool’s iconic Winter Gardens. Is it a show? Is it an art installation? Is it theatre? Tristan Sharps, the man behind the whole project through his dreamthinkspeak company, calls it “site-responsive performance”, and that seems pretty fair, so we’ll go with that. “Site-responsive” as it uses the Winter Gardens and a fictional version of its history to provide the atmospheric backdrop to the mystery-drama narrative. “Performance” because it combines film, theatrical staging techniques and live actors and supporting cast to weave its strange and unique effect on the participating visitors. It’s almost impossible to describe, and any detailed attempt might well undermine the impact of what Sharps and his team set out to achieve. Broadly, there’s a plot about a Blackpool woman, Maggie Morgan, who apparently won big on Premium Bonds in the 1950s and immediately checked into the famous (although, in reality, non-existent) Winter Gardens Hotel, where she’s lived ever since. But now developers are moving in to convert the rundown premises into a budget hotel, and Maggie has to go. Visitors, in groups sometimes as small as one or two, are shepherded into the “hotel” and invited to explore at will. What they find ranges from the fascinating and bizarre to the moving and melancholic. There are staged evocations of Maggie’s 50s heyday alongside subtle clues about her (and the hotel’s) gradual decline, and the whole enterprise is designed to provoke, bemuse and entertain. Sharps has plenty of form in this area – he’s worked on similar projects across the world – and his experience and technical expertise contribute enormously to the success of Absent. Local tourism groups, companies and the Winter Gardens and Grand Theatre are also to be congratulated for their open-mindedness in bringing such an imaginative project to Blackpool. There’s a sadness to the piece that echoes the worn, world-weary town outside the doors, but there’s also a nod to the former splendour of the place, encapsulated in the magnificent Empress Ballroom, which plays host to Absent’s grand finale. It’s hardly your run-of-the-mill Blackpool pier-style show, but it’s one that’s well worth exploring during its all-too-brief run. THE ever-innovative Heartbreak Productions enjoyed a major success with their tour last year of David Walliams’s Mr Stink. Now they’re revisiting Walliams territory with a new adaptation of his children’s book Ratburger. The show already has the stamp of approval of its author, who saw it recently and favoured it with a standing ovation. It’s not hard to see why. The tale of 12-year-old Zoe and her pet rat Armitage (named after the toilet manufacturer Armitage Shanks – it’s a long story) has everything its young intended audience could wish for: sidekicks and villains, a feisty heroine trying to find her place in the world, and lots of knockabout humour to make sure things are never taken too seriously. That’s not to say that David Kerby-Kendall’s entertaining script and Peter Mimmack’s pacy direction shy away from some of the more difficult issues. In fact, their handling of Zoe’s mother’s death, bullying at school and the occasional unfairness of life all have a ring of authenticity to them. But the comedy is never far from the surface, and the joyous resolution quite rightly has the crowd singing happily along. The five-strong cast work incredibly hard – as always with these multi-talented Heartbreak companies – although special mention should perhaps go to Samantha Dart, stepping into a variety of roles at extremely short notice. Her wicked, prawn-cocktail-crisp-munching stepmum Sheila is a beautifully drawn comic character and her willingness to pitch in at the last minute merely typical of the Heartbreak mentality. Janette McManus holds the story together superbly as the wide-eyed, boisterous Zoe, with Georgina Scott wonderfully playful as she represents Armitage himself. Ahmed Ali throws himself into the roles of Zoe’s shopkeeper friend Raj and the evil, rat-murdering burger boy Burt, and Edward Pinner steals the show, doubling as Zoe’s downtrodden dad and – in a hilarious contrast – her disciplinarian, old-school headmaster. Kate Wragg’s simple stage is highly effective, coupled with some brilliant and imaginative tricks with the props and scenery. A supermarket stacking cage, for instance, serves multiple uses from bed to toilet cubicle, while some cafe tables are cleverly transformed into a meat pulveriser. It’s all good, heartwarming stuff and in the regular vein of this ambitious, upbeat company. Ratburger is one of four shows of theirs touring the country this season, and summer wouldn’t be quite the same without them. After the best part of a decade as the resident adapter of Heartbreak’s summer touring shows, writer David Kerby-Kendall has come up with an original script for this new production, playing in repertoire with The Tempest around the stately homes and parks of Britain. All the usual Heartbreak hallmarks are there – pre-show picnics, plenty of audience participation and a healthy dose of British pluck whatever the weather – and it makes for another highly enjoyable performance to add to the company’s extraordinary 25-year catalogue. Murder on the Terrace is an unashamedly tongue-in-cheek spoof of the Agatha Christie genre, complete with toffs, Thirties cliches and some topical social comment to boot. The comedy is broad to the point of risqué at times, and the six-strong cast never take themselves too seriously, allowing the spirited audience variously to cheer, scoff and supply the dramatic musical accompaniment, depending on the requirements of the script. The plot is appropriately labyrinthine, with lots of red herrings and quite a few sidelong digs at the likes of Downton Abbey, and Ben Thorne as Inspector Back of the Yard gently and capably guides the audience towards the suitably expositional denouement. Along the way, his improvisational skills and personable character help make the journey pleasingly jolly. The rest of the company supply at least two characters apiece, one from the ‘Upstairs’ aristocrats, the other from the ‘Downstairs’ drudges, and all have some measure of suspectability in the murder of wine-making heir Charles Cava. The twists are elegantly unravelled as the evening goes by, while Maddy Kerr’s well-paced direction reaches its peak in a wonderful set piece in which more than thirty Christie novel titles are cleverly referenced in a brilliantly choreographed sequence. Oh, the irony. For 20 minutes before its scheduled start time, Mother Nature supplied a tempest of her own to batter down the wills and threaten the very existence of this open-air touring production. But she hadn’t allowed for the iron resolve and show-must-go-on ethos of Heartbreak Productions, which drags its stiff-upper-lip audience along with it in such circumstances and goes ahead and does the performance anyway. And, as if in meek compliance with the spirit of the thing, the torrent abated within a few minutes of the start and everyone settled in for the main event. Director Peter Mimmack’s concept for this enjoyable Shakespearean jaunt is to place it within a company of druids, telling the ancient story of Prospero and his enchanted island. Astutely, he draws links with Shakespeare as the ultimate Bard, and makes much coherent use of the notion to further the storytelling, which is consistently clear and always intelligible. Kate Wragg’s set enhances the idea, with a raised circular platform at the heart of a ring of stones providing the in-the-round playing space, topped with a rather precarious stone table which allows for great variety in the physical levels of the actors but also leaves one’s heart in one’s mouth as the players leap up onto its rain-soaked surface. Happily, the company survived the evening almost intact, give or take the odd slip and knock. So, too, did Shakespeare’s late play, which resonates with the druidic concept surprisingly effectively and makes for a likeable, spirited rendition accompanied by floaty recorder tunes and mystical percussion underscoring. The six-strong cast cover a multitude of roles, with Howard Scott Walker the only single-role performer as Prospero. The versatility and good-humoured pitching in of the company is one of Heartbreak’s hallmarks, and this troupe – who are also playing a spoof murder mystery in repertory with the Shakespeare – carry the banner with aplomb. Audibility is occasionally an issue, exacerbated by the elements and outdoor acoustics, but there’s no doubting the enthusiasm and energy of everyone involved for the whole enterprise, and the bulldog spirit we Brits recognise so well from a lifetime of meteorologically-challenged summers pulls everything through in the end. IT’S June so it must be Heartbreak time. And if celebrating 25 years of this hard-working national touring company wasn’t enough to put the sparkle in your champers, then a version of Wilde’s timeless classic transposed to the flapper era should certainly put a spring in your Charleston. With all the ingenuity and charm that have rightly earned Heartbreak a regular spot in the summer calendar at open-air venues across the UK, the production is somehow staged by five versatile young actors with a mobile bandstand and a tent. This occasionally means some hilarity in the cross-gendering department (Ross Townsend Green’s giggly Miss Prism is a particularly entertaining example) and one or two liberties with character entrances and exits, but the overall effect merely adds to the Roaring Twenties daftness of it all. From Lottie Johnson’s opening turn as the ultra-dry butler Lane, it’s clear Wilde is to be given no special reverence. And quite right too. Much fun is derived from Tania Staite’s knowing Gwendolen and Arthur Velarde’s nice-but-rather-dim Jack, while Yvette Bruin tackles the imposing figure of Lady Bracknell with panache and comes out on top. Director Milla Jackson has clearly guided her ensemble to play it fast and crisply and – given this was the opening night of a three-month tour – the pace never falters, even if one or two of Wilde’s more biting lines lose some of their edge in the process. The 1920s setting works perfectly, too, exploiting the popularity of television’s Downton Abbey to great effect and allowing the audience to be inveigled into proceedings via a device in which we purport to be visitors to a secret country house party where Wilde’s play is being staged by the hosts. To the accompaniment of clinking glasses of fizz and other picnic accoutrements brought along by experienced Heartbreak aficionados, it’s a delightful way to kick off the summer. Playing alongside three other Heartbreak tours this year – The Tempest, David Walliams’s Ratburger and a new murder mystery entitled Murder on the Terrace – this open-air confection is as quintessentially English as one of Algie’s cucumber sandwiches. THE founding producers of regular summer tourers Heartbreak Productions have pulled off a genuine coup with their open-air stage adaptation of David Walliams’s popular children’s book Mr Stink. Walliams – due to see the production during its nationwide run – is fast becoming the 21st Century’s challenger to the undisputed king of offbeat kids’ tales, Roald Dahl. His book about a friendless tramp with a secret past is a favourite of many youngsters, not least for its themes of outsider isolation and pubescent discomfort. Throw in some political messages about homelessness, greed and naked consumerism, and it makes for a heady cocktail. The fact that this new show (it’s touring alongside Love’s Labour’s Lost and Emma this year) manages to speak to adults and their eager offspring alike says much about the charm of the Heartbreak approach. While the grown-ups can sip their pinot grigio and soak up the atmosphere, the children are lapping up the frenetic activity of five hard-working actors and the host of characters they create. Naturally, there’s plenty of audience participation too, and the attention of even the youngest is never allowed to wander. David Kerby-Kendall’s adaptation features a broad range of comic characters brought to life enthusiastically from the pages of his source material, and director Peter Mimmack makes sure the pace never flags. Howard Scott Walker in the title role is endearing and challenging in equal measure – and quite rightly so – while Georgie Hull and Samantha Dart make nicely contrasting siblings as the birthdaying ten-year-old Annabelle and her overlooked older sister Chloe respectively. Danny Milwain plays their father, among a host of entertaining others, while Lily Carrie almost steals the show in the comedic role of their domineering mother. It may not feel quite as slick or rounded as some previous Heartbreak shows, but it’s a definite hit with the little ones and ultimately comes up smelling of roses. So sit back, soak up the sun and a slosh of something sociable, and let yourself be entertained. VETERANS of Heartbreak Productions’ outdoor travelling summer shows are well used to the drill: wine-infused picnics on manicured country house lawns preceding beautifully presented productions of classics, standards and the odd surprise. Of course, there’s always the other side of the British summer, requiring thermal underwear, scarves and brollies galore. But it all adds to the immeasurable pleasure of these charming occasions. St John’s Museum in Warwick delivers in so many of these areas. There are the delightful gardens, the plentiful picnics and the Arctic temperatures by the end of the evening. But, crucially, there are also the impeccable performances of five sterling players offering a nice twist on Jane Austen’s 200-year-old love story. Elegantly adapted by David Kerby Kendall within the framework of a lesson in etiquette, the story unfolds faithfully and surefootedly as the five indefatigable actors march, curtsey, stride and totter through Austen’s army of characters (with the running gag exception of Mr Bennet’s studious daughter Mary – permanently hidden from view in the library). Each performer takes on a host of different characters, successfully rendering them as rounded individuals with their own foibles and features, and with plenty of fun to be had along the way. Jack Fairley’s Mr Bennet and Mr Darcy are equally credible though miles apart. Phillipa Flynn is not just a feisty heroine as Elizabeth, but also suitably girlish as her younger sister Kitty. Tania Staite and Jenny Jenkins provide a veritable smorgasbord of supporting female characters, while Max Attard offers everything from comedy to melodrama in his selection of characters. Under the assured direction of Maddy Kerr, the ensemble and the action never falter, and the evening rattles along at a highly enjoyable pace. As always with Heartbreak, there’s also plenty of audience participation and lots of laughter to be found, both in the source material and in the vagaries of the changeable setting and weather. If you haven’t experienced this capable touring troupe before, they’re also staging Peter Pan and Macbeth in venues across the UK this year. Meanwhile, Pride and Prejudice offers the ideal initiation into what has rightly become a staple of the summer season. ALL the talk about this show has been to do with the stage debut of onetime Neighbours starlet turned pop singer Natalie Imbruglia: can she actually do it live? Well, the short answer is yes, but there’s so much more to this production than a theatrical coming-of-age. Alan Ayckbourn’s 1997 play shows the writer at his most barbed. Not only does it microscopically and uncomfortably examine the nature of what we call love, but it does so at the expense of all of its four characters. None escapes without brutal treatment at the hands of at least one of the others and, with the possible exception of Imbruglia’s character Nikki, all are left morally exposed, without much decency. All this is handled with the customary Ayckbourn mixture of high comedy and extreme poignancy, adding extra power to its punch, although there’s more than a hint of discomfort about the use of domestic violence for comic effect. What stands out most in this production, however, are the sublime performances of the destructive pair at its core. Imbruglia gives a fine account of herself, but her newly-in-love ingenue serves as a foil to the wonderful Edward Bennett as her fiancé Hamish and the feisty, prickly Claire Price as her former school prefect Barbara, with whom the couple stay while their new home is reconfigured by builders. Giles Cadle’s clever set places the action on three floors of Barbara’s house – the ground floor, where she lives, the upstairs flat, where Nikki and Hamish are staying, and the basement apartment of dodgy lodger Gilbert, played for maximum farce by Simon Gregor. Director Laurence Boswell employs the trick of only showing us the bottom two feet of the upstairs flat and the top two feet of the basement, which focuses the attention fully on Barbara as her happy spinsterhood comes crashing down around her. Fortunately, Price is more than up to this tricky job, making her character both horribly believable and paradoxically sympathetic. Bennett, meanwhile, displays immaculate comic timing and an extraordinary variety of facial expressions, and their partnership is crucial to the flow and success of the whole enterprise. Go and see it for Natalie Imbruglia, by all means, but don’t fail to be impressed by the rest of this classy package as well. CAN you have too much of a good thing? Well, possibly, if the good thing is all more of the same in large doses. But when those doses, spread across three productions throughout a single day, are as varied, thought-provoking and moving as the current Ayckbourn Ensemble on tour, they simply leave the audience hungry for more. Sir Alan himself, this country’s most prolific living playwright, has concocted this menu of delights for touring the country before a five-week stint off-Broadway later in the spring, directing his own work as usual. And what a feast it is. It starts with the amuse-bouche of Farcicals, two one-act plays featuring the same pair of neighbouring couples in varying degrees of miscommunication, undress and outright silliness. There’s no pretence of a deeper message, just laugh after laugh as the straightforward farce gets dafter and dafter, all played with appropriately straight faces by the quartet of actors. It’s worth paying particular tribute here to Peter Halpin, stepping into his role as an understudy for the first time and pulling off the extraordinary trick of looking as if he was cast in the part in the first place and has been playing it all tour. Next up is a revival of the 1992 play Time of my Life, in which Ayckbourn explores his fascination with time and its relevance to our lives. Here, a family gathering in a favourite restaurant forms the central focus in real time, while two nearby tables play out the storylines of the family’s two sons, one advancing in time, the other retreating backwards through a series of vignettes. It’s poignant, clever and surprisingly dark, but with plenty of wit to leaven the heavy themes. Ben Porter as a collection of waiters earns most laughs, but the real substance of the piece is in the women’s roles, and Sarah Parks, Emily Pithon and Rachel Caffrey excel as their distinctive characters. The day’s Ayckbourn-athon rounds off with his latest piece, Arrivals & Departures, which takes a step further into the darkness as it ponders the unreliability of memory and the pursuit of happiness. That’s not to say it’s short of comedy – it certainly isn’t – but it’s more concealed, offset by real pathos and consequently more thoughtfully won. At the heart of this striking production are two magnificent performances from Elizabeth Boag and Kim Wall. She’s a young Army officer, buttoned-up and giving nothing away as she performs babysitting duties for a witness who can identify a terrorist suspect about to arrive at a large London train station. He’s the aforementioned witness, a jolly, naïve Yorkshireman with a penchant for talking aimlessly and an ill-founded optimism. Adding to the complexity, they’re surrounded by a large supporting cast of chaotic Army personnel pretending to be civilians as they await their suspect. Act one reveals her backstory in a series of flashbacks, while act two does the same for him. Each is devastating in its own way but it’s the sheer bravado of Ayckbourn’s juxtaposition of these two completely separate figures that gives the piece its emotional punch. Boag and Wall grab their roles with glee, relishing the opportunity to bring these quirky, three-dimensional characters to life. The denouement is probably as moving and heartbreaking as anything in the entire Ayckbourn oeuvre, and yet this central pair uncover a simple redemptive quality that stays with you long after leaving the theatre.